There are some days which, however simple you think they might be, end up being anything but. Today was one of them. Lets roll the clock back to last night. I do get frustrated on those ‘rest days’ when I’ve done the resting bit or in the case of yesterday, the tourist bit. Don’t get me wrong, the visit to the archaeological site at Olympia was fascinating and highly recommended but towards the end of the day I become just another tourist looking for something to do. Travelling alone can be difficult at these points and I get easily frustrated and bored just sitting in a café or a restaurant contemplating what I have just done or what I’m about to do. Yesterday was kind-of saved by an interesting chat to the 90 year old owner of Camping Diane (more about him in the book!) and then an extended conversation with a couple of Texan brothers who were travelling with their mother and father around Europe for the sixth time. They didn’t really fit the Texan stereotype of red neck Republicans (I did tell them so). Perhaps they were former family fiends of the Bush family who were bent on really annoying them after some kind of feud and wanted to be as liberal, Democratic and European-centric as they could possibly be. That’s entire conjecture. They were interesting and there will be more about them in the book too (although I forgot to ask their name so they will be referred to under some kind of pseudonym. Perhaps the Bush family to be really ironic…). We all retired to our respective tents in the hope of a good night’s sleep but did we get it? Of course we didn’t! The hotel next door was having some kind of festivity taking place within its four walls, well, actually it must have been in the garden as the music continued to blare out at 2am, 3am (it must finish then, no? ), 4am (!) and finally stopped at 5am. I did get some sleep as I dreamed about two former colleagues (it could have been you!) but it was a short dream. Once again, getting out of the tent was more a boredom thing rather than because I particularly wanted to. Showered and packed by 8:30 my departure was delayed in a nice way by continuing the conversation from the previous evening with one of the Texan boys and this time his father. He’s a teacher and in Texas they have what’s called the 80 year rule. If your age plus the number of years you have taught add up to 80 you can take retirement. He is about to be 53, has taught for 27 years and bingo! What do you think of that Mr Gove? Today’s cycling destination was the town of Patras. The plan was to stay in a campsite somewhere either south or north of the town – there appeared to be plenty – and then cycle over the modern bridge back to the mainland tomorrow. As I say, that was the plan. For much of the day the roads were just as predicted; long and flat. Perhaps a little boringly so. Some of my days are going to be transitory ones spent cycling through nondescript places from a place of more interest to another place of more interest. Today fitted that description. I spent much of my time considering what I would actually write about in the chapter called ‘Cycling Day 5’ in the book. There wouldn’t be much to say. I tried to look out for some interesting things to photograph; some of them are below. 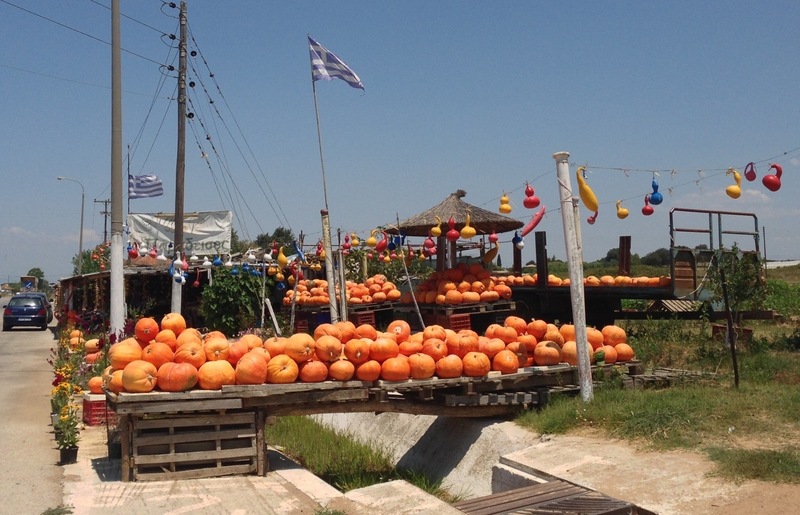 I passed many stalls selling melons; very colourful! 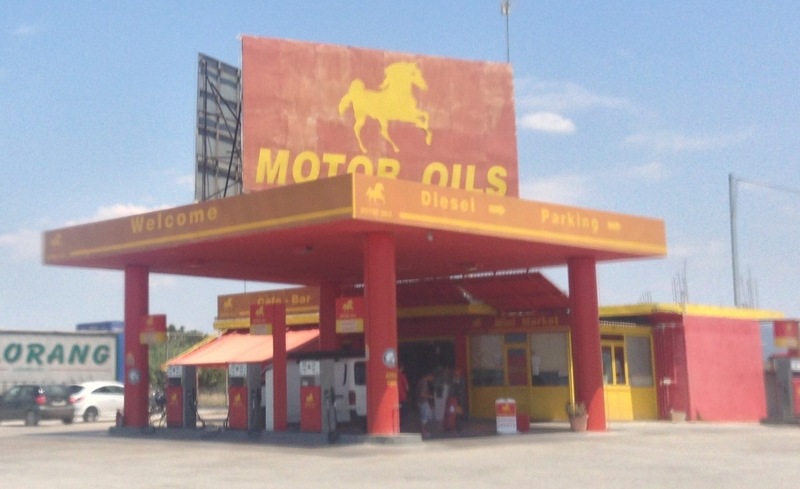 As was the very red petrol station (I’ve never been to country with so many petrol stations by the way!). There continued to be far too many miniature churches by the side of the road to mark the death of a motorist and I did wonder whether they had more or less effect on the drivers than the signs warning them that cameras were in operation. 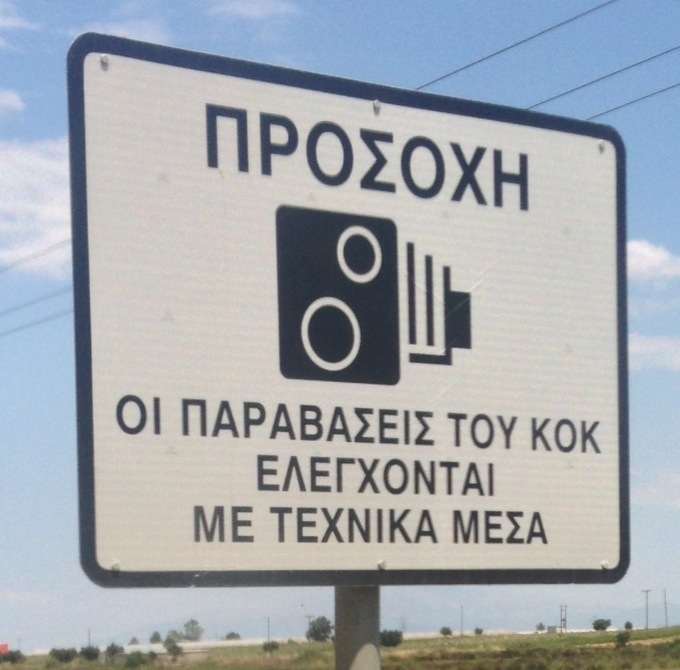 Interesting to note that the old style camera seems to have been adopted as the international symbol for a speed camera. I paused at various points for refreshment and replenishment. None of my stops were of particular note but each was much welcome, especially the stop to scoff a packet of chocolate cookies just to the south of Patras. Goodness knows what the guy at the stall thought as I sat on his plastic chair and promptly devoured the lot within minutes of buying them. It was a little frustrating finding my way around Patras itself but I did eventually find my destination; Camping Rion. 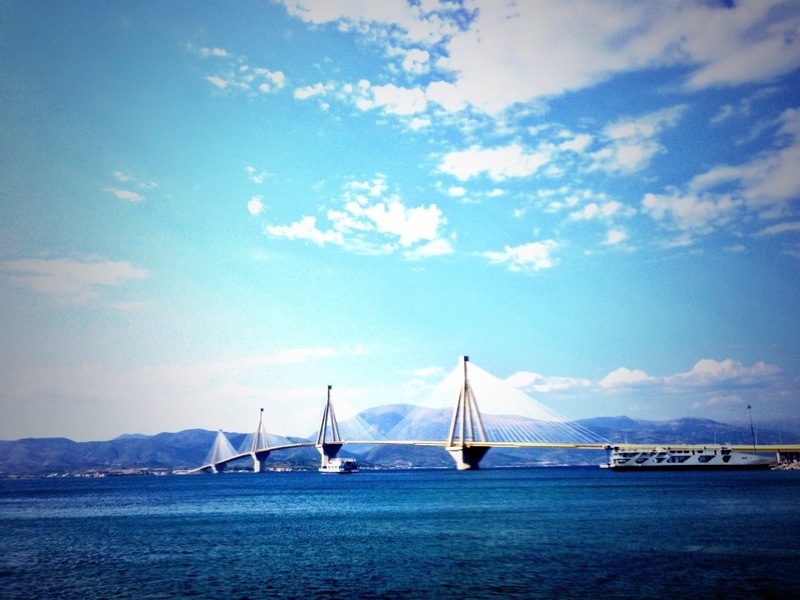 It was one establishment squeezed into a strip of bars, restaurants and nightclubs (some shut down) just to the south of the new (2004 I think) bridge that spans the stretch of water between The Peloponnese and and mainland. I sighed with relief on seeing the sign and cycled towards the cluster of building where hopefully someone would smile and directly me towards a pitch. ‘We are closed’ said a surly woman who has missed out on charm school. Break it to me gently why don’t you? 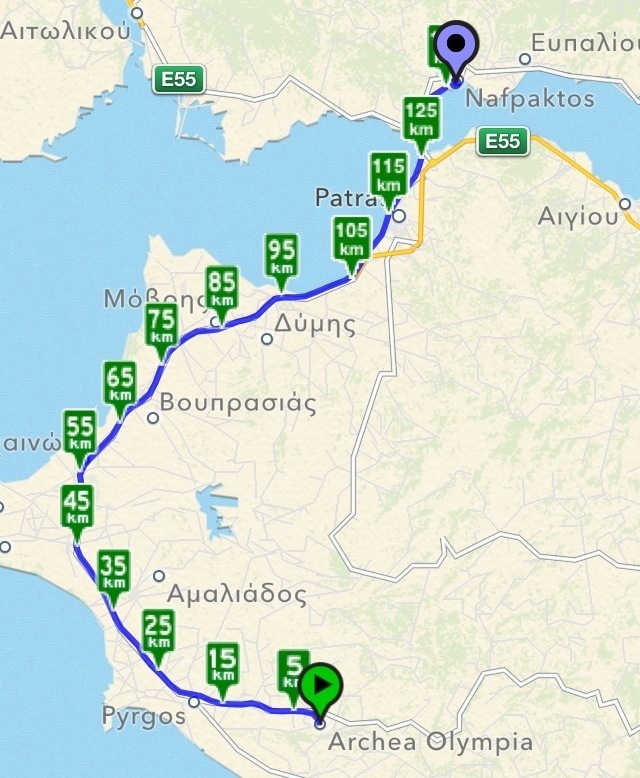 ‘I’ve just cycled over 100km for you to say that and imply through your tone of voice that its my fault that your campsite has decided to shut not yours or the current economic situation in Greece’ I would have loved to say but of course didn’t. Perhaps her customer service had something to do with it. My map did indicate that there was another campsite on the other side of the bridge but I had wanted to savour that moment tomorrow. Alas it wasn’t to be and I trudged over the world’s longest multi-span cable suspension bridge (too much description there for it to be really impressive) in search of my plan B site. That didn’t exist where my map alleged it would be. Plan C – another campsite up the coast slightly – wasn’t to be found either. Plan D was to say ‘bugger this, it’s getting late and I now need a hotel’. I continued to cycle and eventually arrived in the pleasant town of Nafpaktos. The first hotel turned me down when finding out that I was travelling alone (how does that work?) but the second, despite being staffed on the reception desk by a close relative of Rosa Klebb did give me a nice room for a nice price; 56€. It was worth the extra cycle. Yes, it’s a nice little spot. I’m still here at 10:18am which for me is a late departure as its nice just to sit and watch the world go by. I’ve just also posted the bag to the British Council in Coimbra. It should arrive within the next week or so. When do you head back to Britain? Going anywhere interesting on your way there? I love reading about your adventure as it unfolds ! I’m happy to hear that there may be some positive things about Texas, I was having a hard time coming up with any myself. Seriously though, it always warms my heart to hear stories of my countrymen actually behaving decently as tourists. Chin up, lad. You’re just easing yourself in. You’ll be fine in a few days.